When a United States Senator is brutally murdered, the evidence points to a Soviet assassin code- named Cassius, who was long-thought to be dead. Two men who know Cassius best are thrown together to catch him. Paul Shepherdson (Richard Gere) is a retired CIA operative who spent his career tracking Cassius around the globe. Ben Geary (Topher Grace) is a hotshot young FBI Agent and family man who has studied the killer's every move. Ben thinks he knows Cassius, but Paul knows he is dead wrong. Now, time is running out to stop this merciless killing machine before he finds his next target. The Double - Film Clip: "Escape"
The Double - Film Clip: "Where Is He?" 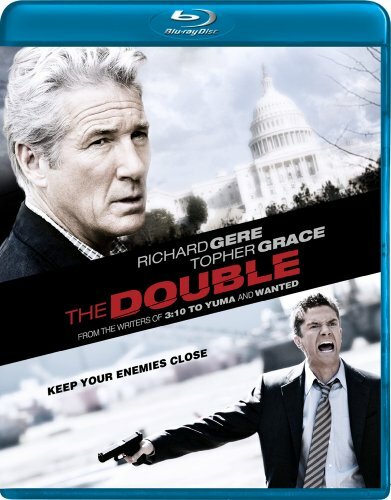 The Double - Film Clip: "Brutus"
When a United States Senator is brutally murdered, the evidence points to a Soviet assassin code- named Cassius, who was long-thought to be dead. Two men who know Cassius best are thrown together to catch him. Paul Shepherdson (Richard Gere, An Officer and a Gentleman) is a retired CIA operative who spent his career tracking Cassius around the globe. Ben Geary (Topher Grace, Spider-Man 3) is a hotshot young FBI Agent and family man who has studied the killer's every move. Ben thinks he knows Cassius, but Paul knows he is dead wrong. Now, time is running out to stop this merciless killing machine before he finds his next target. Martin Sheen (The Departed), Stephen Moyer (True Blood), Odette Yustman (Cloverfield) and Stana Katic (Castle) costar in this tense thriller from the co-writers of Wanted and 3:10 to Yuma that will keep you guessing until the very last shot.